When we take a photograph, we are recording the light reflected from objects on to either film or digital media, so lighting is photography. The first rule of photography is that every “rule” was made to be broken at least some of the time. That definitely applies to lighting. Why do they use all these devices? One reason is because each type of light is different from the others. A flash is generally the sharpest type of light, a photo-flood is slightly less sharp, but easier to control, and reflected light is the softest source of light. Diffusers are used to soften light and make it more even, and some umbrellas are used to block light, others are used as reflectors. Where is sunlight in all this? That depends, on the time of day and the atmospheric conditions at the time. Around noon on a sunny day without a cloud in the sky and low humidity, sunlight is even a bit sharper than a flash unit. As the clouds thicken and the humidity goes up, sunlight becomes softer. That’s because the sunlight is bouncing off from or passing through water molecules in the air. Think of your shadow, the sharper it is, the sharper pictures taken then will be. Clouds are nature’s diffusers, they soften the sunlight and even it out, that’s why you don’t see shadows on a cloudy day. Tree leaves and other things in nature can act like diffusers as well. When the sun is low on the horizon, like at sunrise or sunset, the light is softer as well. Another reason the pros use all these devices is that they are they are going for a particular mood in their finished photos, and every type of light also has what is known as color temperature. Not only do light sources vary in intensity and sharpness, but they also vary in color somewhat, corresponding to wavelength of light that they emit. Since this is about nature photography, I am not going to go into color temperature any deeper here. If you’re a pro that shoots mostly in a studio, you probably already know about color tempreature, if not, I consider it an advanced topic, and there are many sources off information available online. Unless you’re a pro, you’re probably don’t have an army of assistants to lug around all the light sources and control devices the pros use, or the generator to power them, and if it is an animal that you are trying to photograph, it wouldn’t be around any more once you did get everything set up. So, what can you do? I am going to go out on a limb here and say that there is no such thing as bad lighting, only bad use of lighting. Think about some of the pictures you’ve seen, and thought were really good ones. I’ll bet they run the gamut from very sharp lighting, to very, very soft lighting. Very soft lighting is often called mood lighting. We all love very sharp pictures, but we also find pictures taken with soft lighting pleasing as well. The trick for those of us who are amateurs is to choose our subjects and compose our photographs for the light we have, rather than for the light we wish we had, and to make use of the tools we do have to make our pictures better. After saying that though, there are two related conditions that continue to vex me. One is trying to take pictures of scenic panoramas late in the afternoon on cloudy days, the other is photographing birds or other subjects against a cloudy sky. Here are some examples. 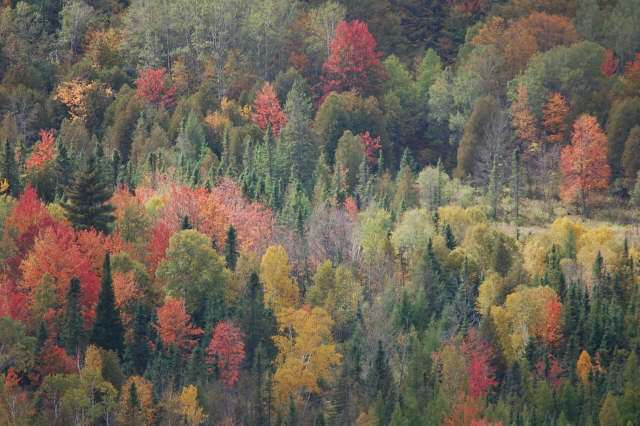 The first picture was taken on a fall day before noon. Now here’s one taken late in the afternoon on a mostly cloudy day. The second photo isn’t a bad picture, but it doesn’t have the “zing”, the sharpness of the first one. Here’s the other situation, photographing a subject against a cloudy sky. 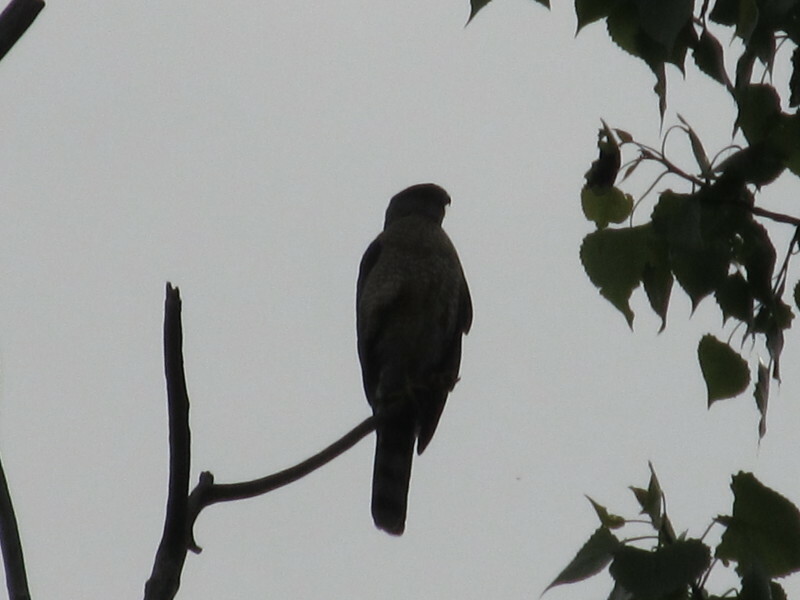 I was getting ready to go kayaking, and I heard the call of this hawk behind me. I turned and saw that I would be shooting towards the sun, but shot anyway, just to get something, which as you can see, wasn’t much. 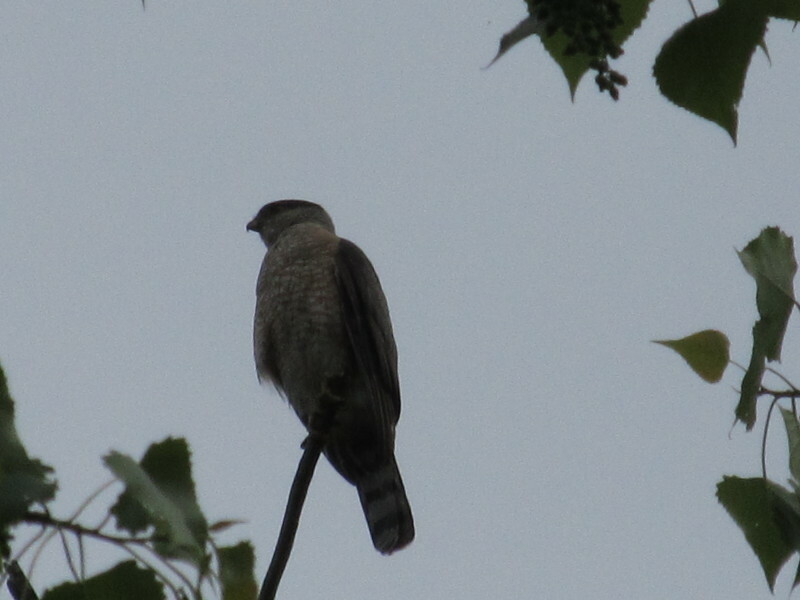 As you can see, all detail and color of the hawk were lost. I managed to sneak around him so that I had what sun there was coming through the clouds behind me, and got a somewhat better picture. Same hawk, with the sun behind me. This one is a little better, you can begin to make out some details and colors, but it still isn’t great. Surprisingly, he sat still while I was circling around underneath him, trying to find the best lighting I could. As you can see in this last one, by framing the hawk in the leaves of the tree, I was able to cut out most of the clouds that were behind him, and got the best shot of him I could under the conditions. This picture isn’t great by any means, but it is the best of the series I took. After this last one, he flew off, so that ended my experimentation. Here are some general rules of thumb on lighting. Typically, the best lighting is from around 8 AM to noon or a little after. Pictures taken during this timeframe will be sharper and crisper than pictures of the same subject taken during the late afternoon. Some of this is due to the physics of light, some because of atmospheric conditions, as I explained earlier. Of course you can’t take pictures of a sunset at noon, and there other times to throw this rule out as well. Generally, you’ll get your best pictures with the sun behind you. If you can look down and see your shadow either in front of you or off to the side, that’s normally your best lighting. If you’re shooting into the sun, it doesn’t matter what time of the day it is, you are going to have to adjust for that fact, or come back at a later time if it is possible. Although, there are times when shooting into the sun can yield dramatic effects, known as backlighting, I will discuss that later. If you do have to shoot towards the sun, try to block it out as best you can with trees, hills, the horizon, or anything else available. Try to limit how much of the sky appears in the picture, and zoom in if you can on your subject if you can. Otherwise most of the details in the shaded areas in your photos will be lost. Let’s say you are taking a picture of the sun setting behind a mountain. If you fill most of the frame of the picture with the sky, the mountain will appear as a black lump in your picture, and you won’t be able to see anything on the side of the mountain facing you. If you lower your camera so that very little of the sky is in the frame, then the camera will expose the picture so that the mountain is well lighted, you’ll be able to see the details of things on the side of the mountain, but the sky may appear washed out from being over-exposed. This is one of those times when you should shoot lots of pictures, moving the camera slightly after every shot. Because of the variations between cameras, light meters, and camera settings, I can’t tell you what balance between mountain and sky will give you the best result. The best advice I can give you is to start shooting, move the camera after each shot, and shoot until after the sun sets behind the mountain. You can sort through the pictures later and delete the ones you don’t like, you may well find several that you really like, but for different reasons in the variations in the lighting. If the subject is small enough and close enough, use your flash, even on a bright sunny day with blue skies. This is called fill-in flash, and it is one of the most underused tools that you can use to improve your photos. Especially if it is a cloudy but still fairly bright day, using fill-in flash can improve your photos immensely. Let’s say you’re walking along and see a bird in a bush about 10 feet from you, but the sun is behind the bird. If you take a photograph without a flash, even if you almost fill the frame with the bird, the photo won’t capture the details of your subject very well. Here’s an example of how using a fill-in flash turned blah into ahhh. I wish I had shot the same shot without using the flash to show the difference, but I didn’t. Compare this photo to the hawk series above, though, and you can see how much better using your flash for fill in lighting can make your pictures. You can see how well the camera was able to record the details and colors, and how vivid the shot is when compared to even the best picture of the hawk I was able to get. With out the fill in flash, this picture would have been just like the hawk picture. Using a fill-in flash has other added benefits as well. One is that they help stop action. If you’re old enough to remember the disco days, or been around a strobe light, you’ve seen how a strobe light has the effect of stopping movement. The flash on a camera is a strobe light, and it has the same effect of stopping movement when it fires. By adding more light to the subject, it helps in a second way by decreasing the amount of time the shutter is open to capture the picture. Faster shutter speeds means less chance for motion. If you are trying to “freeze” the wings of a hummingbird for example, using the flash will help. I have found that using a fill-in flash has an extra side bonus as well when photographing animals. At first I was worried the flash going off would frighten animals away, limiting how many photos of them I would be able to take, but I have found the opposite to be true, the flash going off seems to freeze them in place. That’s not surprising when you think about it, a flash going off in our faces freezes us in place until our eyes re-adjust after being hit with the flash. It seems to have the same effect on animals as well. Another reason to try a fill-in flash from time to time is you never know what effect the flash will have on plants and animals. Sometimes the fibers of plants, or the fur of animals, or the hair on insects react in completely unexpected ways when you use a flash. I guess the best way to describe this is with another picture. Here’s the same shot without flash. You can see what a difference the flash made. Not only are the willow blossoms exposed correctly in the first picture, but the parts of the blossoms seem to pick up the light in an unexpected way, almost like one of those fiber optic lamps they sell as home decor. I was going for the second picture here, the willows silhouetted against the pastel evening sky, I only turned the flash on for the heck of it, not knowing what the result would be. It pays to experiment! Parts of plants and especially insects react to the flash in unexpected ways, so you don’t know what you’ll get until you try. The limiting factor in using a fill in flash is the range. I find the flash on my compact digital camera to be of some benefit out to about 20 feet, but it does best when the subject I’m photographing is 10 feet or less from me. The flash unit on my SLR is good out to a little more than 20 feet, and does a really good job out to around 15 feet, so you will have to learn your equipment, since all cameras and flash units vary. 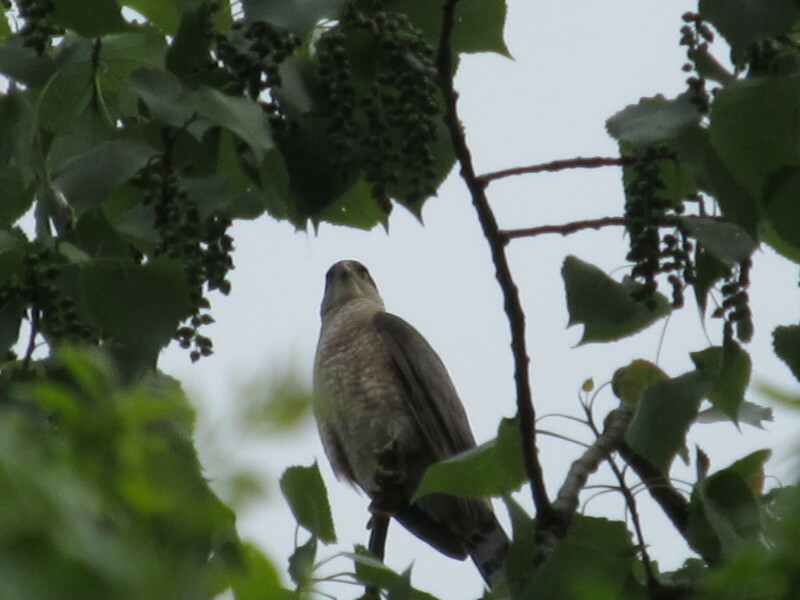 I would have loved to have been able to use a flash unit when I was taking the hawk pictures, but I know of no unit that would work out to 50 feet, the height the hawk was above me, perched in the top of a tree as he was. With today’s modern cameras, using the flash is a piece of cake. You simply raise the flash, turn it on, and the camera does the rest. There’s no need to set the flash synchronization shutter speed, look up guide numbers, or any of the rest of what you used to have to do. So I am not even going to explain all that. On very dark, cloudy, and rainy days, using a flash becomes even more important, and in a way, broadens the field of subjects that can produce great photos, as long as they’re in range of the flash. Here’s an example of what I mean. This same shot taken on a sunny day would have been a ho-hum kind of photo, but the water from the rain combined with the brilliance from the flash unit turned these everyday shelf fungi into an interesting subject for a picture. It may not look like it in this shot, but it was so dark and dreary on the day that I took it that my camera was telling me to use the flash for every shot I took that day. 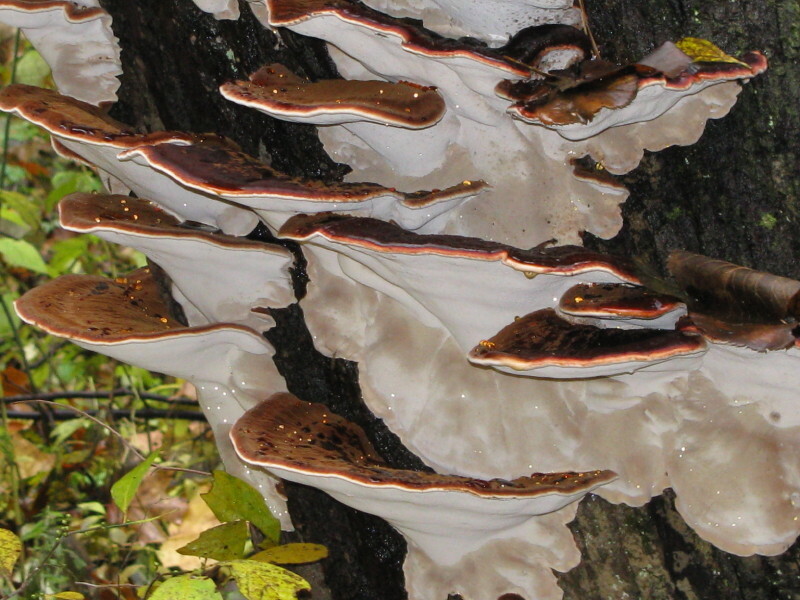 Shelf fungi may not be your idea of an interesting subject for a photo, but the same principle holds for many things you’ll see in nature on a wet day. So keep the use of your flash unit in mind on days when it is wet out, and try it out on various things. 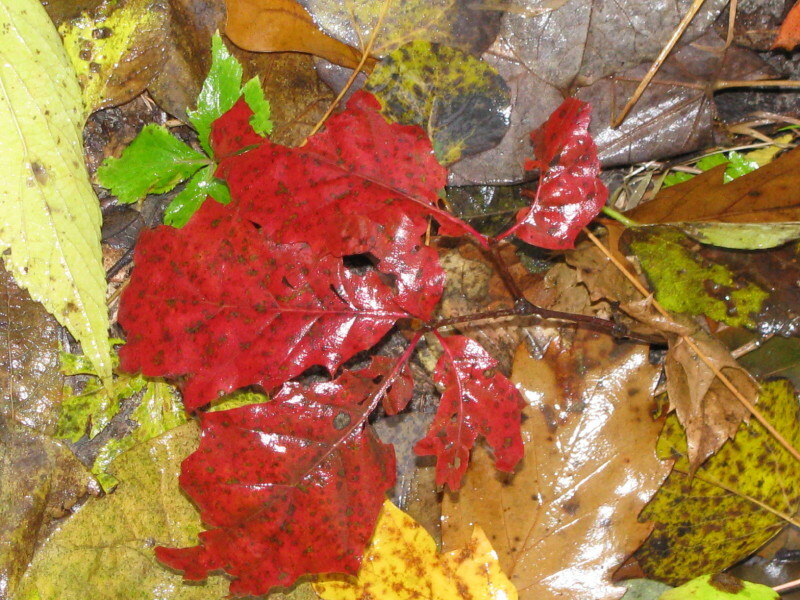 You will be surprised at what a difference the flash will make, and how when things are wet, like fallen leaves, the colors can come alive when lit by a flash. There are two times that come to mind when using a flash isn’t a good idea, close up, or macro photography, and when you want to convey the sense of motion by allowing the motion to blur part of the picture, such as water in a waterfall. If your camera has a built-in flash, it is probably aimed so that the light from it hits the center of what your camera sees at about ten feet or so. When you get very close to the subject, only part of the frame will be hit by the light from the flash, normally the top edge of the picture. The rest of the picture will end up be under exposed. If you have a detachable auxiliary flash unit that can connect to your camera via a cable rather than the hot shoe, then, you could hold the flash off to one side with one hand, aiming it towards the subject, and use a tripod to hold the camera while you take close up pictures. It will take a few test pictures to get the hang of it. You’ve probably seen pictures where the photographer used a slow shutter speed to allow moving water in the picture to be somewhat blurry, while the rest of the picture is sharp. To do that, you’ll need a tripod to hold the camera still. Set your camera to shutter priority, and adjust the shutter speed to 1/30 of a second to start. Turn your flash off, and take a test shot. If the water is too blurry, go to a faster shutter speed, if it isn’t blurry enough, go with a longer shutter opening. There are times when taking pictures with the sun behind your subject can produce dramatic effects. One is backlighting and the other is silhouettes. First, backlighting. Anything that has translucent properties is a good candidate for backlighting. Also, anytime you see a scene that you think would yield a dramatic, high contrast photo. Sometimes you can combine the two, as in this example. 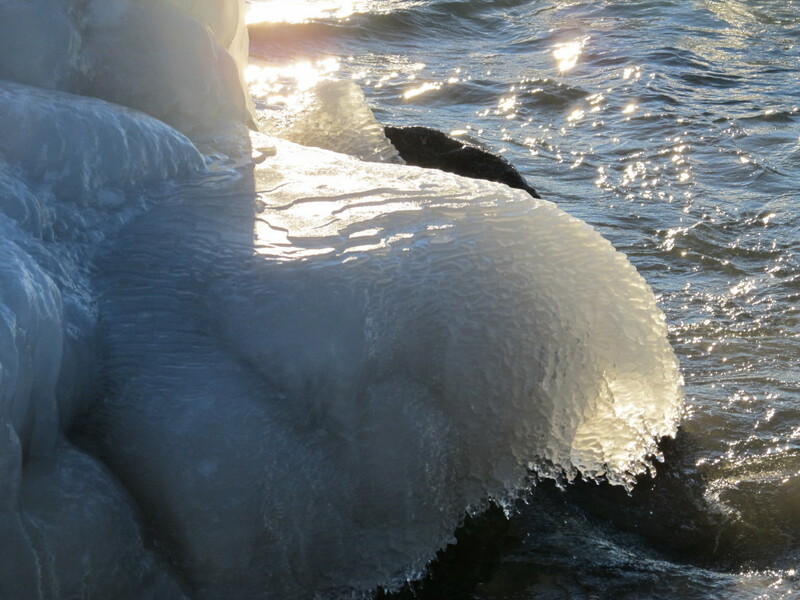 In this photo there is the sunlight shining through the edges of the ice, and at the same time, producing a high contrast photo. What attracted me to this scene in the first place was the patterns that you can see in the ice, how it built up in layers. But, from where I first saw the ice, any kind of good photograph was impossible due to the bright sunlight shining directly at me. I knew there was a good picture to be had there, so I moved around until most of the sunlight was blocked, giving me what you see here. Here’s another from the same area. 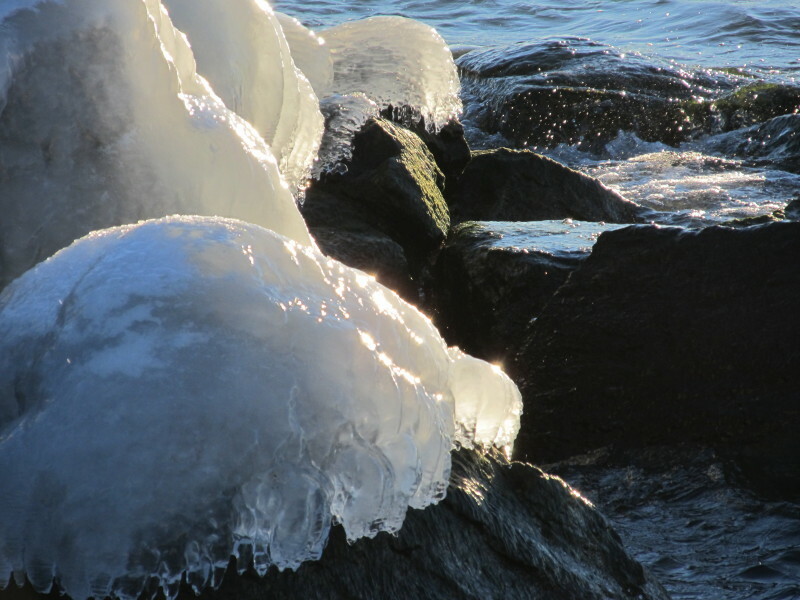 In this one the ice isn’t as interesting, but that is made up for in the high contrast seen between the ice, rocks and water. I can’t possibly tell you here every scenario where backlighting with either the sun or artificial lighting will yield great results. But, I can give you a list of some candidates that are worth trying this technique out on are. Water, ice, snow, flowers, leaves, plant fibers, insects and their wings, animal hair, bird feathers, anything that allows some sunlight to travel through it. If it catches your eye, investigate the possibilities. You’ll have to move around the subject to find the best angle and possibly something to block out some of the sun if it overpowers the subject. Then, you’ll have to zoom in or out to get the right amount of backlighting as a part of the overall scene. Use your flash to fill-in some of the details if you can, and if it will add to the picture. This shot of a damsel fly is a combination of backlighting and using the fill-in flash. You can see the hairs on its legs because of the way they are backlit by the sun, yet you can see the colors of the damsel fly because of my using a flash. 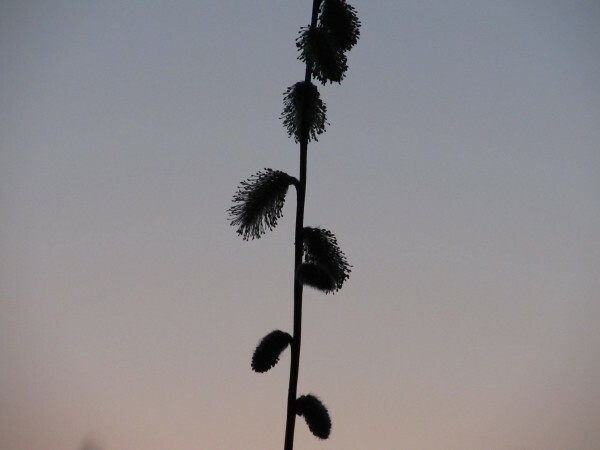 Without the flash, all you would see is a silhouette of the damsel fly. If I had used my flash on the ice pictures, it would have ruined the high contrast effect I was going for. 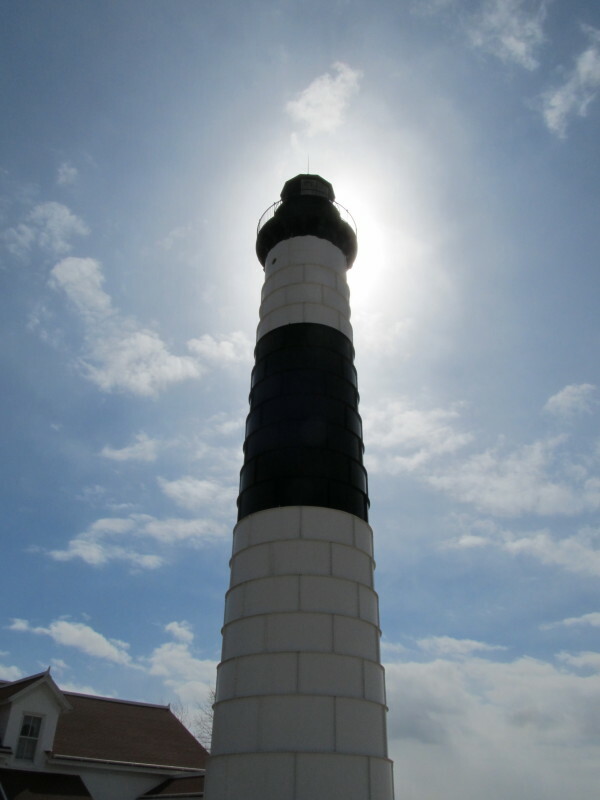 Another use for backlighting is the halo effect it can generate, as seen in this picture of a lighthouse. For this picture, I moved around the lighthouse until the sun was directly behind where the light is in the tower, creating a halo around the top of the light. Again, I can’t tell you everyplace or subject you should try this on, you’ll have to explore the possibilities yourself. 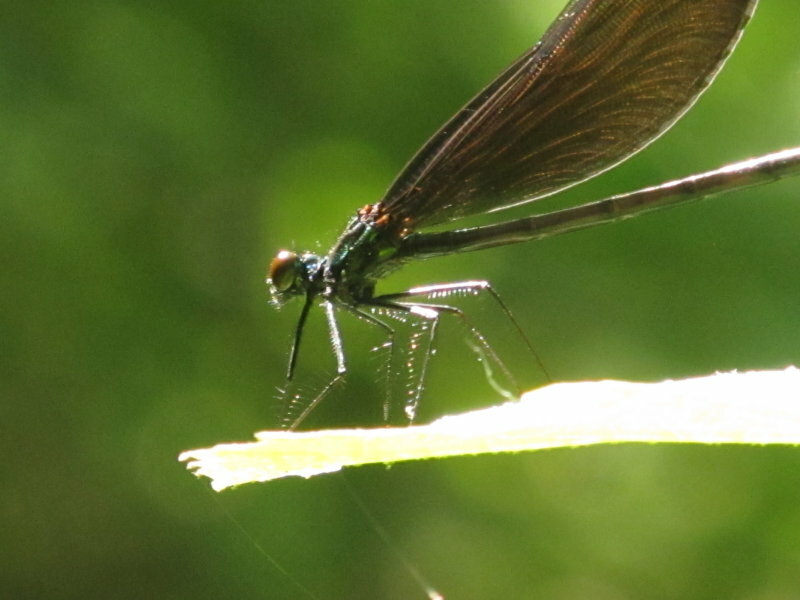 As I noted on the picture of the damsel fly above, without the fill-in flash, all you would have been able to see would be a silhouette of the damsel fly. Sometimes silhouetting a subject can produce a striking image, as seen here. This shot was taken late in the afternoon. The sparkles from the water caught my eye first, then the heron. It was way too far away to even attempt to get a good picture of it using a flash or any other means, but the scene was just too good to pass up. 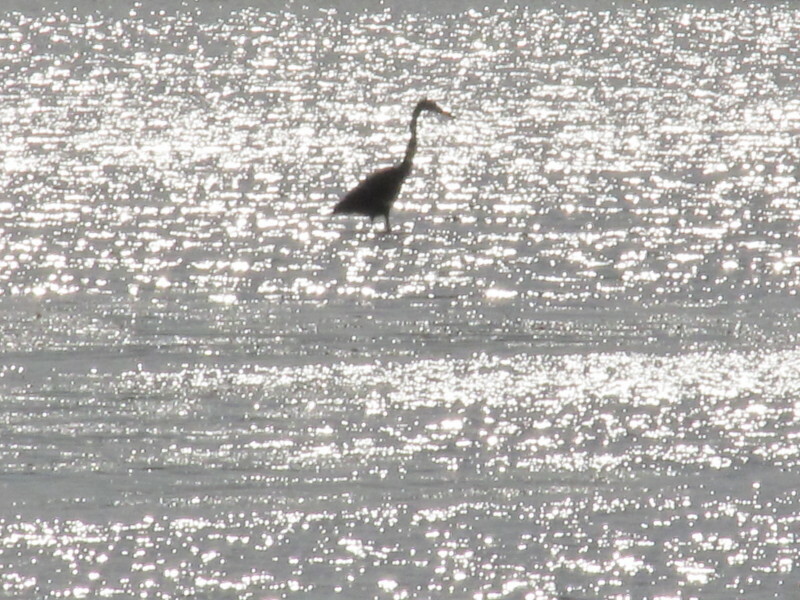 Without the silhouette of the heron in this picture, the sparkling water would have been an OK but boring photo. I knew that because of the lighting that the heron was going to show up as just a silhouette, but it adds a lot to the photo. Almost anything, from a building to a bird, is a candidate for being silhouetted, it depends on the background and the subject. There are several things in nature which are considered to be difficult backgrounds to take good pictures against, such as beach sand, water, snow, and clouds. Anything bright and expansive. For the most part, the one that gives me the most trouble is clouds, like in the photos of the hawk above. To me, the worst days for taking good pictures are days when there is a blanket of white to light grey clouds in the sky. The darker the clouds, the better, to me anyway, if there are going to be clouds at all. The best days are ones with few to no clouds, but those are a rarity here in Michigan, especially in the winter. Generally, none of the difficult backgrounds other than clouds pose that much of a problem for me, maybe I’ve been lucky so far. The way to work around these difficult backgrounds is to get as close to your subject as possible, and/or find something to block them out of the picture as I did with the leaves in the hawk picture, or use fill-in flash if you can. Lighting isn’t just important to good photography, lighting is photography. Therefore, you should plan in advance as much as you can to make use of the best lighting you can get. This is especially true of landscape photography, and doubly so if you are planning a trip of a lifetime to a place such as Yellowstone, Yosemite, or the Grand Canyon as examples. Since you can’t rearrange landscapes, you should plan your trip in advance so that you are at the places you know you are going to want to photograph at the times when the natural lighting is best. Most of the time that’s going to be in the morning, but not always. 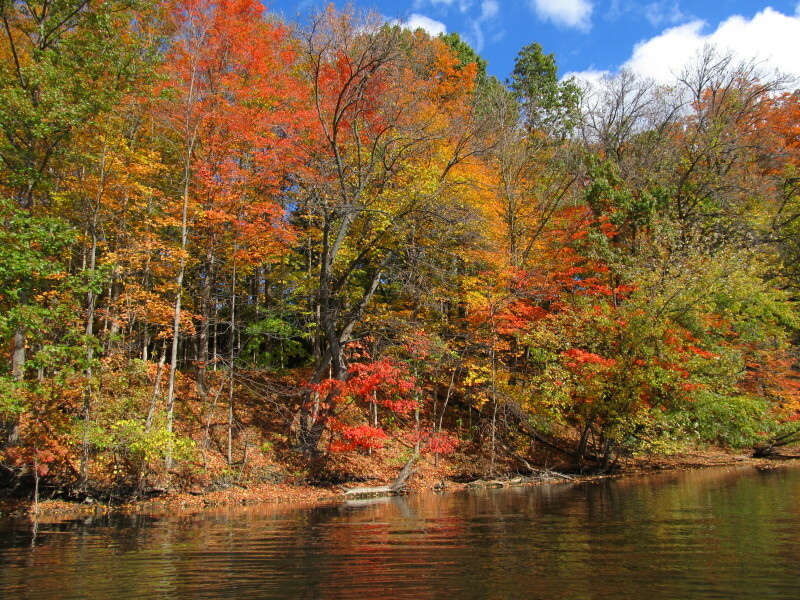 Looking at maps and photographs others have taken can help you plan your trip. Even on a walk through a local park, take the lighting into consideration. Don’t walk into a rising or setting sun if you don’t have to, go the other way around so the sun is at your back. If you see a stationary subject to photograph, but the lighting is wrong, walk around it until the lighting is right. Even for animals, try going around them until the light is better. They may run off before you make it, but you won’t know that unless you try, and you may be surprised to find that they watch you walk around them, as long as you don’t get too close. If you see something that would make a great photo under different lighting conditions, make note of it and go back to it when the light is right. Make the best use of the light you do have in the way you compose your pictures, and by zooming in and out if you have a zoom lens, or by moving closer or farther away if you don’t. If something catches your eye, check it out by exploring other angles to photograph it at. Don’t forget that your flash can be used during the day as well as at night. Fill-in flash is the most underused photo technique there is, and it is one of the easiest to use, as long as the subject is in range. Experiment, taking a bad picture isn’t going to ruin your camera, so try some off the wall pictures and see how they turn out. Even ff they don’t turn out, you’ll be learning. Take lots of pictures, even of the same subject. Take a flower, and shoot it from all different directions to see how the effect of light at different angles affects your pictures. DO the same thing with many subjects, shoot them from all angles to learn lighting. The only way to really learn lighting is to take many pictures, until lighting is so ingrained in your mind that you don’t have to think about it anymore, except for times when you do want to experiment. I genuinely enjoy reading on this web site, it has got good articles.